The starling was first successfully established in the US when fewer than 100 birds were introduced in Central Park in 1890. Another 40 birds were introduced there in 1891. 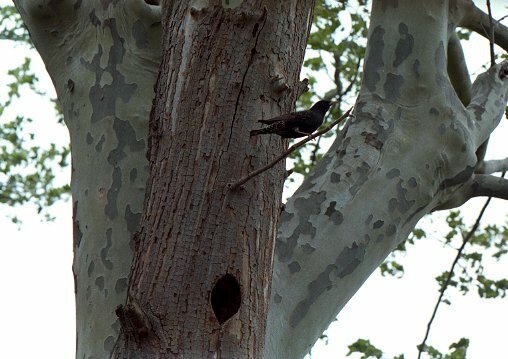 The starlings thrived and by 1904 had spread to New Jersey and Connecticut. By the 1920's, starlings were present in most of the eastern U.S. Starlings are the most numerous bird species worldwide. It is estimated that their current population in the U.S. tops 200 million. Starlings frequently use the nest cavities excavated by woodpeckers, driving flickers, red headed and red bellied woodpeckers from their nests and even watching as woodpeckers excavate a new cavity, then ganging up on the woodpecker and commandeering the cavity. I have observed flickers excavating several nest cavities during spring and early summer, losing each one to starlings and failing to nest at all that year. The hoards of starlings also usurp nest cavities from all our native secondary cavity nesting species. While the 1 1/2" round entrance hole used in bluebird boxes effectively excludes starlings, bluebirds nesting in natural cavities seldom have this ideal size entrance. Luckily, starlings are less common in more remote areas where bluebirds, great crested flycatchers, tufted titmice, and other cavity nesters use natural cavities. However, much of the eastern and mid-western U.S. have quite large starling populations. Native cavity nesters are put under tremendous pressure in these areas. The flicker and red bellied woodpeckers and flycatcher find it almost impossible to nest in areas heavily infested with starlings. It has been shown that placing more flicker boxes in starling infested areas does not increase the chance of a successful nesting, since more boxes simply lead to the recruitment of more starlings. But, perhaps, the species most at risk is the purple martin. The many martin landlords who monitor their colony and control starlings and house sparrows are essential to sustaining this species. But, one can still see from the road, many fancy martin houses in back yards with starlings or house sparrows perched on top. The future of the purple martin likely depends, not on the number of martin houses, but, rather on the ratio of good to bad martin landlords. Since purple martins in the East are totally dependent on housing offered by humans, they have few alternatives to substandard housing. Bluebirds, on the other hand, usually have many options when confronted with unmonitored backyard nest boxes. There is usually a natural cavity or a properly monitored nest box in the vicinity. But, martins require large multiple cavity nest boxes or multiple gourds and these are expensive and thus few and far between. Each potential martin colony site is important. If such a site attracts martins and the human landlord then allows starlings or house sparrows to "share" the housing, the martin colony is eventually doomed. A surprising number of people who offer martin housing or bluebird nest boxes can't identify a starling or even a male house sparrow. Others may, in fact, be very knowledgeable, but, for some mystical reason, cannot kill any living thing. By enticing martins to use the site and then allowing starlings to move in, they are, of course, eventually killing martin nestlings by their inaction. Once we transplanted the starling from its native ecosystem and it began to wreak havoc on our native cavity nesters, the responsibility to correct this eco-catastrophe became ours. &COPY; 2002 - 2009, American Artifacts and Richard Van Vleck, Taneytown, Maryland.